Whenever guests come to town I take them to The Waffle Window. It’s great affordable food, with a cute blue door, making it feel like you have a little secret and it sits in the heart of the Hawthorne District. It makes for a fun, eventful day. I should also point out, they do have a 2nd location on Alberta. Also another great area to experience. Again I bring you another family venture. Their story is worth reading on their webpage. The 2 sons, after traveling in Europe, convinced their mom, Mary, who is a pastry chef, that the waffles there were better than what we had here. Seriously, check out the story for yourself, I just love it. The 2 boys began this adventure with their mom and it has become a huge success. Creative toppings are things that draw me to The Waffle Window. There are staples and there are always seasonal specials. I love both. I also love that you can go for breakfast, lunch, dinner or even dessert. Even though I prefer the savory waffles it was a special treat one night when we were out and about. We had already eaten so we stopped in for dessert. I had never thought of it as a dessert place until that night. I was a huge fan of the 3 B’s, Bacon, Brie and Basil, until recently I ventured out and ordered the Farm Fusion, and now I have a new favorite. All of the sweet waffles are also a treat. In the summer when the berries are ripe for the picking, the specials that fly out of there are amazing. But don’t be sad when those are gone, because Mary has many more surprises. I will be choosing 2 winners for this last one. One lucky winner will receive a $10 gift certificate and the other will receive a $15 gift certificate. It will all be a random draw. Leave a comment letting me know which waffle should never be taken off the menu? 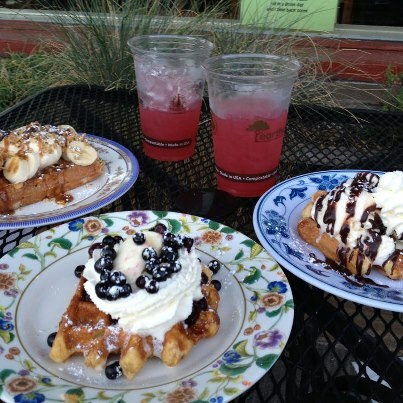 If you have never been, let me know which waffle you would love to try. You will receive an entry for each thing you sign up for. Lots of chances to win. Good luck and I hope you enjoyed my birthday month as much as I did. This giveaway will end on Monday, Feb. 25th. I’d love to try either the Nutella and Fresh Banana waffle, or the Apple Pie Waffle. Both sound absolutely delicious. I liked them on facebook! (already like you!) I’ve never been to The Waffle Window, but it sounds delicous!! I’d like to try The Blueberry Cheesecake waffle! YUM! I love waffles, what a great story Thank you for sharing.. The apple pie waffle is first on my list. Happy Birthday! The nutella and fresh banana is SO good and should never be taken off the menu 😉 We went last Fall and it was such a fun little place… can’t wait to go again! Thanks Amy! oh my goodness… NOW I WANT A 3B’S!!! oh it’s soooooo so good! 3 B’s should never be taken off – what a great combination!